College of Music (RNCM) in Manchester, UK and returned to Japan in 2005. He recently won the Mortimer Fuber Prize for Conducting, a prize awarded to the most promising graduate at the RNCM. As the first Japanese to win this prize, he has attracted a great deal of attention. Born in 1979, Sadaharu joined the brass band at Atago Elementary School where he learned to play the trumpet and horn at a very early age. He then joined the wind orchestra at Aoi Junior High School and Yutakano High School. During this time he also studied conducting, most notably under Hirofumi Misawa. 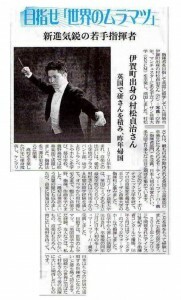 After graduation from high school in 1997, he went to the UK with the primary aim of studying to be a conductor. He graduated from Anglia Ruskin University in Cambridge with a BA Hons in Music in April 2003, and went on to postgraduate study on the prestigious Mmus Conducting course at RNCM. There he studied a wide range of music, conducting and composing works from opera to contemporary music. On one occasion, he conducted a marathon of 35 new works in one evening concert, the scores for which had been given to him only two days in advance. He said, “At first, I faced a big English-language barrier. However, I soon realized that music is borderless and I met many wonderful musicians there”. In 2001 Sadaharu won the first prize in the ISIS 20th Orchestra Conducting Competition in Cambridge, UK. During his postgraduate year in the UK, he conducted at the internationally famous venue, Bridgewater Hall in Manchester. In December 2005 he was awarded the Mortimer Furber Prize for Conducting as “One of the most promising students of the year” by RNCM. Sadaharu has always wanted to conduct and has great ambition. “I am grateful that I gained such a lot of experience and met so many wonderful people in the UK. They are all precious experiences. I have enthusiasm for becoming a world-class conductor with a broad view”, he said enthusiastically. We have great hopes for his worldwide success.